Take gulab jamun mix in a bowl. Add some warm milk instead of water to make the dough. Gently knead the dough and set it aside for 10 minutes. Add finely some chopped almonds, pistachio in the dough and roll it into small balls. Make sure there are no cracks in the balls, so fix if any by dabbing little oil on your fingers. I prefer to make small balls, for even cooking of jamuns from inside out and kids love the size. Prepare the syrup in a pan, by boiling - water, sugar, saffron, rose water and cardamom for enhanced flavor. Heat ghee/oil in a deep skillet. I used canola oil and fry the jamuns on low heat till it turns dark brown. Take out the jamuns on the paper towel and soak them in sugar syrup. Leave for a few hours, preferable overnight. The gulab jamuns can be either served at room temperature or a little warm. Can be warmed in a microwave for 10 seconds just before serving. Can't beat the feeling, warm thin caramelized crust outside & sweet and soft from inside. 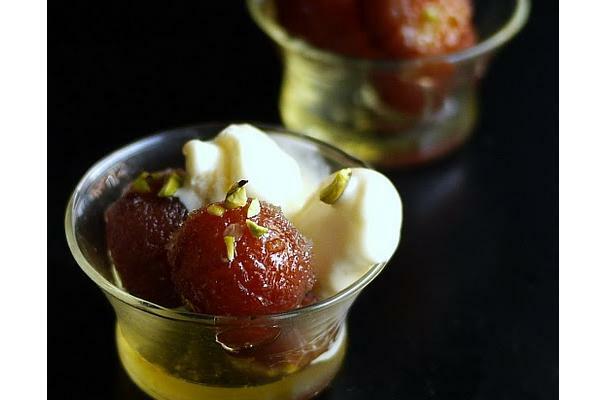 I like to top up the gulab jamuns with pistachio just before serving and with a scoop of vanilla ice cream.